A great, refillable, polycarbonate plastic foraging toy for your smaller to mid sized feathered companions! Fill the Push & Pull with seeds, dried fruit, etc. Your parrot must push and pull slats back and forth to release the treats into the chamber below where it may be retrieved and enjoyed. Your parrot can repeat the process time and time again! Also, check out the Capsule, Sphere, Wheel, Generation II Wheels, Carousel, Paddle Wheel, and See Saw foragers! The Push & Pull arrives empty and ready for you to fill with your parrots favorite goodies. 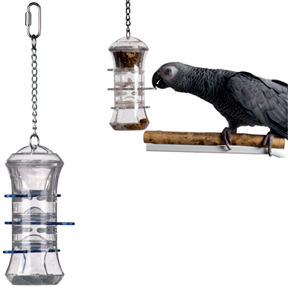 Offer only dry, healthy treat foods in these feeders, empty them often to avoid spoilage! You can wash all acrylics in one part bleach, 3-4 parts water, rinse thoroughly and air dry!